Man, am I rushing today! I have been in a whirlwind of activity all day long trying to get my normal stuff done, and finish up all my nighttime blog crafting early plus get ready for my hubby's birthday! I used the CAS(E) This Sketch #127 pretty much exactly as drawn. I'm still working on my neighbor's card class, so I wanted to use this sweet butterfly from Find Your Style one last time before it flutters over next door. I stamped it in Cocoa Ink onto some Canary cardstock, then added in darker gold touches on the edges with a marker. I popped that onto some squares of Blossom B&T, following the color cue from ColourQ #294. Even though this is a beginning card class I couldn't help myself from piercing around the edges of the main stamped element. Can you see the "stitching? White gel pen run over the pierced holes. Even white on white you can still see it in real life, which gives a nice definition to a simple card. I'm off to whip cream for the birthday pie for my sweetie! See ya tomorrow! This is gorgeous! I love the patterns on the butterfly and I can totally see the "stitching!" Thanks for playing along with us at colourQ! 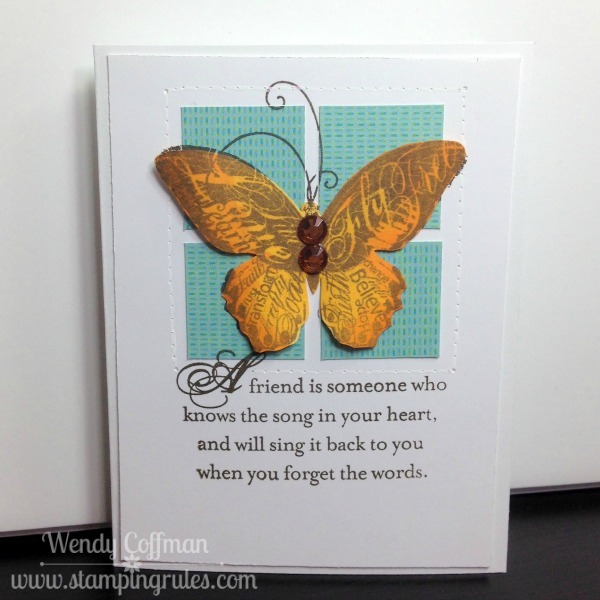 Beautiful card, Wendy, love that butterfly! Happy birthday to your husband and thanks for joining in the fun at the colourQ. Beautiful card! That butterfly is gorgeous! Wonderful take on the sketch! First congrats to your hubby on finding the project life kit! That is exciting stuff. 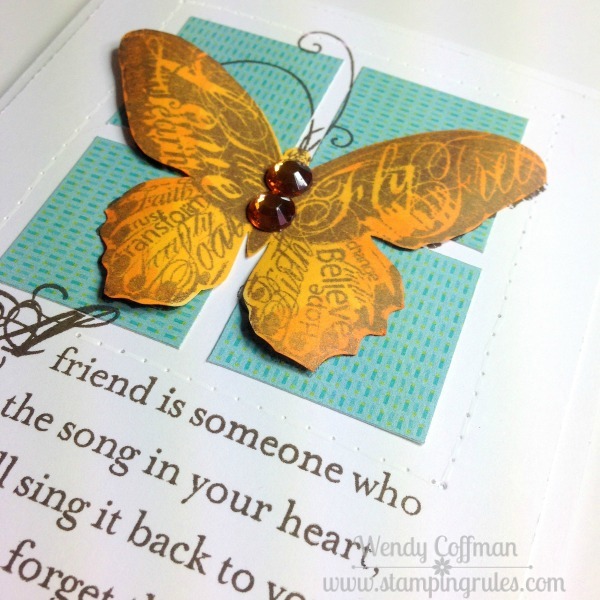 And your card is fabulous...love your beautiful butterfly paired with that sentiment. Thanks for joining us at ColourQ! Beautiful card with a beautiful sentiment. So true!